Fallängetorp B&B, cottage and activities – with nature around the corner. At Fallängetorp farm you can live in our cosy cottage Lillstugan, or stay at our accessible Bed and Breakfast Mellangården. Here you can live with nature around the corner and participate in the daily work around the farm, according to your desire and ability. On the farm we have activities for all ages. Here you can get acquainted with the operations of an organic farm, hike in nature and have the opportunity to participate in the work of a Swedish farmer. The farm is a place where you can meet animals and experience nature in a calm and peaceful environment. Fallängetorp is situated 150 kms north of Stockholm in a scenic landscape on the border between the regions of Västmanland and Dalarna in the middle of Sweden. It´s 130 km from Arlanda airport and 65 km from Västerås airport to Fallängetorp B&B, cottage and activities. Staying at Fallängetorp is to be in the middle of an open landscape of fields and pastures with the forest around the corner. You´ll waking up to the sounds of grazing sheep and the crowing roster in the farmyard. Fallängetorp is a B&B and cottage on a farm north of Sala in the region of Västmanland. Here everybody can experience an organic farm with cows, sheep horses, pigs, dogs, cats and hens. Choose between staying at Mellangården – our newly renovated, modern and accessible bed and breakfast, or at Lillstugan – our cosy little cottage where you can listen to the fire in the wooden stove. 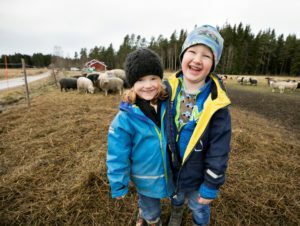 At Fallängetorp you get an insight into what life at an organic farm is. The activities changes with the seasons. In spring you can, among other things cuddle with the newborn lambs and you have the opportunity to try out what it’s like being a farmer for a day or more. 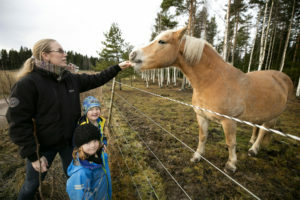 Here you can visit the animals in their stables / paddocks, rid a horse, travel by horse-drawn or tractor-pulled carriage. You can follow a guide into the forest to look for birds, hike along a nature trail with picnic basket and why not pick berries and mushrooms in the summer and fall season. You can use the bike or Zoom and with a picnic basket explore the countryside. And when it´s winter ski across along the fields or bring your skates to one of the nearby lakes.